This review was originally published on Insatiable Booksluts in March 2014. Up until a few months ago, I had no idea what The Turn of the Screw was about, despite having several high school classmates who read it for their English classes (somehow none of my classes ever got around to it). I knew it was heralded as a “classic,” so I put it on my TBR list a few years ago but never went out of my way to buy it. When I found a cheap copy at The Strand in NYC in March 2014 and discovered that it’s a ghost story, though—i.e., right up my alley—I had to get it. The Turn of the Screw is the story of a young governess who is contracted by a man to take care of his niece and nephew who, due to the deaths of their parents, have fallen into his care. The man hires the governess on the condition that she never disturb him with any sort of communication, related to the children or not. She agrees, though not without reservations, and he sends her out to his country house, where the children are staying under the care of the housekeeper, Mrs. Grose. The children, Miles (10) and Flora (8), are the picture of perfection: both are beautiful, fair, and well-behaved. However, when Miles returns from school for the summer, he comes with a notice that says he has been expelled, but gives no reason why. Mystified but unable to contact her employer for fear of a rebuke, the governess wonders what a seemingly perfect child like Miles could have done to be expelled. Soon, she begins seeing ghostly apparitions around the house: misty figures on stairways, faces in windows—you know, the usual. 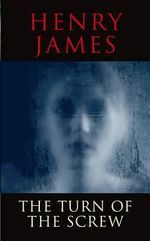 She describes the apparitions to Mrs. Grose, who identifies them as the ghosts of two former employees, Peter Quint and Miss Jessel, who not only had a relationship with each other but who also were close with the children. (There’s some implication that they were a bit too close with the children.) The governess is determined to protect Miles and Flora from seeing any of these supernatural visions, fearing for the safety of their souls—but soon begins to fear that she is too late to save them. My immediate thought upon finishing The Turn of the Screw was that, despite the fact that it was only a novella, it still could have been about half the length without losing any essential content. This is the first Henry James I’ve read, so maybe this isn’t news to y’all, but damn, can he ramble! I know long, jumbly sentences were the style back then, but wow. I’m sure some of the near-incomprehensible run-ons were supposed to be indicative of the governess’ panicked state of mind, but after a while it was just exhausting. (Side note: very glad now that I did not read this in high school, because I can guarantee I would not have enjoyed it. My biggest hurdle when it comes to the classics—and this is one that I still struggle with—is the flowery, beat-around-the-bush, let’s-not-say-what-we-actually-mean-because-SCANDAL style of writing. When I have the patience to sit and decipher everything, I usually find it rewarding, but I’m a skimmer by habit so this doesn’t always work for me.) We also could have done with a fewer raptures over how perfect and beautiful and smart and amazing these children were, especially considering the fact that in the few lines of dialogue they each have, it seems pretty clear that they both use their angelic appearances to their advantage. On the other hand, I would have appreciated more substance—a lot of the novel was the governess ruminating on events, and very little actual action. And maybe it had something to do with the ridiculous run-ons I mentioned above, but this governess didn’t really seem to have the greatest handle on herself. I mean, maybe it was different back then, and seeing a ghost would indeed be a sign of eternal damnation or whatever it was she was afraid of, but it seemed like most of the actions she took to protect the children from the ghosts were based purely on a “feeling” that they were evil. Which brings me to another point: I confess that I will occasionally read the Wikipedia synopsis of a book if I don’t feel like I completely understood it (rather than go back and try to read it again). Upon checking out the Wikipedia entry for The Turn of the Screw, I discovered the “insane governess theory,” which postulates that the ghosts were actually a figment of the governess’ imagination, and that she somehow physically caused Miles’ death. (The text would otherwise suggest that Miles dies when the governess banishes the ghost, which still makes it technically her fault, but not in the way the “insane governess theory” suggests.) I don’t quite buy into the whole “she’s taking out all her repressed rage at her father (?) and the master of the house on Miles” thing, but I don’t think it’s too far out of the realm of possibility that she’s just off her freaking nut and kills the kid out of fear and/or psychosis. Or, ya know, it’s also possible that it was just supposed to be a more or less straightforward ghost story and we’re just reading too much into it. Have you read The Turn of the Screw? What did you think? How do you feel about the insane governess theory? I totally get how it can be hard to rate classics. There are classic novels that I despise, but I never know how to say that to people. That being said, I thought your review was really interesting to read! And I loved how you mentioned that you probably wouldn’t have enjoyed this book if you had read it in high school. Isn’t it interesting how certain books are perfect for certain times in our lives, and completely wrong for other times? I’ve not read this particular classic, but it sounds like it could be fun for a moody Halloween read, so long as you don’t mind the wordy passages. Oh, absolutely. There are so many books I read on my own after high school that I never would have liked if I had had to read them for school (something about HAVING to read a book is a good way for me to not like it, too!). I’ve just read Washington Square by Henry James and loved it, will try The Turn of the Screw next. Like you, I think I was very lucky not to have read some books in school – which can spoil future enjoyment if you aren’t ready for that book.